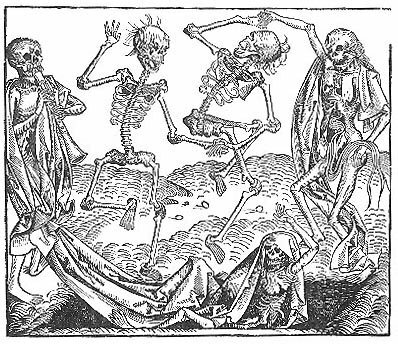 An old drawing "Dance of The Dead", by Hartmann Schedel [1440-1514], in "Liber Chranicarum, " Nuremberg 1493. German Humanist and historian, b. at Nuremberg, 13 February, 1440; d. there on 28 November, 1514. He matriculated at Leipzig in 1456, received the degree of baccalaureus in 1457, and of magister in 1460. He then chose jurisprudence as his professional study, but at the same time zealously pursued humanistic learning under Pieter Luder, whom he followed to Padua in 1463. He there took up the study of medicine in which he obtained a doctorate in 1466. In 1472 he became a physician at Nordlingen; in 1477, at Amberg; in 1481, at Nuremberg where he lived until his death. He was closely connected with scholars and artists and his large and varied learning exerted a stimulating influence upon other students. His chief work is a chronicle of the world, "Liber chronicarum", which contributed much to the spread of historical knowledge. It was first published in 1493 at Nuremberg, a German translation by Georg Alt appearing in the same year. The division of the work into six ages and the point of view are entirely medieval. The work is a compilation following earlier chronicles closely and generally, even verbally; it depends particularly on the "Supplementum chronicarum" issued at Venice in 1483 by Brother Jacobus Philippus Foresta of Bergamo. The thoughtful, conservative, and rigidly orthodox Schedel does not often express his own opinion. The book owes its popularity in part to the great number of fine wood-cuts executed by the two artists, Michael Wolgemuth and William Pleydenwurff. Schedel's activity in tracing out, collecting, and copying MSS. produced results of much value even to-day. Many an important monument has been preserved only in his copy. Special mention should be made of his collection of inscriptions, the "Liber antiquitatum", completed in 1504. His large and valuable library containing over three hundred MSS. and several hundred printed books came into the possession of John Jacob Fugger in 1552, and was afterwards obtained by Duke Albert V of Bavaria (1550-1579) for the ducal, now royal, library at Munich, where it now is.